Eyeglasses today are fashion accessories, as stylish as purses and belts. In fact, you’ll find familiar names — Calvin Klein and Gucci, to name just two — on your choice of frames these days. So don’t fret if contact lenses irritate your eyes. Instead, scope out the latest fashion frames to give your face a fresh look. What Types of Eyeglass Lenses Are Available? As technology advances so, too, do eyeglass lenses. In the past, eyeglass lenses were made exclusively of glass. Today, most eyeglasses are made of high-tech plastics. These new lenses are lighter, do not break as easily as glass lenses, and can be treated with a filter to shield your eyes from damaging ultraviolet light. The following modern eyeglass lenses are lighter, thinner, and more scratch-resistant than glass lenses or the older, common plastic lenses. Glass lenses. In the early days of vision correction, all eyeglass lenses were made of glass. Although glass lenses offer exceptional optics, they are heavy and can break easily, potentially causing serious harm to the eye or even loss of an eye. For these reasons, glass lenses are no longer widely used for eyeglasses. Plastic lenses. In 1947, the Armorlite Lens Company in California introduced the first lightweight plastic eyeglass lenses. The lenses were made of a plastic polymer called CR-39, an abbreviation for “Columbia Resin 39,” because it was the 39th formulation of a thermal-cured plastic developed by PPG Industries in the early 1940s. Because of its light weight (about half the weight of glass), low cost and excellent optical qualities, CR-39 plastic remains a popular material for eyeglass lenses even today. Polycarbonate lenses. These eyeglass lenses are impact-resistant and are a good choice for people who regularly participate in sports, work in an environment in which their eyeglasses may be easily scratched or broken, and for children who may easily drop and scratch their eyeglasses. Polycarbonate lenses also provide ultraviolet protection. Polycarbonate lenses in the early 1970s, Gentex Corporation introduced the first polycarbonate lenses for safety glasses. Later that decade and in the 1980s, polycarbonate lenses became increasing popular and remain so today. Originally developed for helmet visors for the Air Force, for “bulletproof glass” for banks and other safety applications, polycarbonate is lighter and significantly more impact-resistant than CR-39 plastic, making it a preferred material for children’s eyewear, safety glasses and sports eyewear. A newer lightweight eyeglass lens material with similar impact-resistant properties as polycarbonate is called Trivex (PPG Industries), which was introduced for eyewear in 2001. A potential visual advantage of Trivex is its higher Abbe value. Trivex lenses. These lenses are made from a newer plastic with similar characteristics of polycarbonate lenses. They are lightweight, thin, and impact-resistant and may result in better vision correction than the polycarbonate lenses for some people. High index plastic lenses. Designed for people who require strong prescriptions, these eyeglass lenses are lighter and thinner than the standard, thick “coke bottle” lenses that may otherwise be needed. High-index plastic lenses in the past 20 years, in response to the demand for thinner, lighter eyeglasses, a number of lens manufacturers have introduced high-index plastic lenses. These lenses are thinner and lighter than CR-39 plastic lenses because they have a higher index of refraction (see below) and may also have a lower specific gravity. Aspheric lenses. These eyeglass lenses are unlike typical lenses, which are spherical in shape. Aspheric lenses are made up of differing degrees of curvature over its surface, which allows the lens to be thinner and flatter than other lenses. This also creates an eyeglass lens with a much larger usable portion than the standard lens. Photochromic lenses. Made from either glass or plastic, these eyeglasses change from clear to tinted when exposed to sunlight. This eliminates the need for prescription sunglasses. These eyeglass lenses may not darken in a car because the windshield could block the ultraviolet rays from the sun. Polarized sunglasses. Light reflected from water or a flat surface can cause unwanted glare. Polarized lenses reduce glare and are useful for sports and driving. These lenses may cause the liquid crystal displays on the dashboard of cars to appear invisible. The type of vision problem that you have determines the shape of the eyeglass lens. For example, a lens that is concave, or curves inward, is used to correct nearsightedness, while a lens that is convex, or curves outward, is used to correct farsightedness. To correct astigmatism, which is caused by distortions in the shape of the cornea, a cylinder shaped lens is frequently used. Simply put, the eyeglass lens is a tool you use to focus light appropriately onto your retina. Here are popular eyeglass lens materials, arranged in order of refractive index and lens thickness (pretty good indicators of cost). Except for the crown glass, these are all plastic materials. What Are Multifocal Eyeglass Lenses? People who have more than one vision problem often need eyeglasses with multifocal lenses. Multifocal lenses, such as bifocals and trifocals, are eyeglass lenses that contain two or more vision-correcting prescriptions. In years past, you could spot a multifocal lens by the line separating the two sections. But today, multifocal lenses, called progressive lenses, can be made to look seamless. Bifocals. Bifocals are the most common type of multifocal lens. The eyeglass lens is split into two sections; the upper part is for distance vision and the lower part for near vision. They are usually prescribed for people over age 40 whose focusing ability has declined due to presbyopia. Presbyopia is an age-related change that affects the natural lens in the eye. Trifocals. Trifocals are simply bifocals with a third section used for people who need help seeing objects that are within an arm’s reach. This additional segment is above the bifocal portion of the lens and is used for viewing things in the intermediate zone; for example, looking at a computer screen. If you have questions about which eyeglass lens is right for you, talk to your eye doctor. He or she can help you choose the lens that best fits your lifestyle and vision needs. Scratch-resistant coating and ultraviolet coating. Most eyeglass lenses today have built-in scratch resistant coatings and ultraviolet protection. Anti-reflective coating. If glare becomes a problem, consider an anti-reflective coating applied to new eyeglasses. Anti-reflective coating will reduce reflections, decrease halos around light, and create a nicer cosmetic appearance. Anti-reflective coating. An anti-reflective (AR) coating makes all eyeglass lenses better. AR coatings eliminate reflections in lenses that reduce contrast and clarity, especially at night. They also make your lenses nearly invisible, so you can make better eye contact and you and others aren’t distracted by reflections in your lenses. AR-coated lenses are also much less likely to have glare spots in photographs. Anti-reflective coating is especially important if you choose high-index lenses, because the higher the refractive index of a lens material, the more light the lenses reflect. In fact, high-index lenses can reflect up to 50 percent more light than CR-39 lenses, causing significantly more glare, unless AR coating is applied. Anti-scratch coating. All lightweight eyeglass lens materials have surfaces that are significantly softer and more prone to scratches and abrasions than glass lenses. The softest eyeglass lens is also the one that is the most impact-resistant: polycarbonate. But all plastic and high-index plastic lenses require a factory-applied anti-scratch coating for adequate lens durability. UV-blocking treatment. Cumulative exposure to the sun’s harmful ultraviolet (UV) radiation over a person’s lifetime has been associated with age-related eye problems including cataracts and macular degeneration. For this reason, people should protect their eyes from UV beginning in early childhood. Thankfully, polycarbonate and nearly all high-index plastic lenses have 100 percent UV protection built-in, due to absorptive characteristics of the lens material. But if you choose CR-39 plastic lenses, be aware that these lenses need an added coating applied to provide equal UV protection afforded by other lens materials. Most of today’s modern anti-scratch coatings (also called scratch coats or hard coats) can make your eyeglass lenses nearly as scratch-resistant as glass. But if you’re hard on your glasses or you’re buying eyeglasses for your kids, ask about lenses that include a warranty against scratches for a specific period of time. Photochromic treatment. This lens treatment enables eyeglass lenses to darken automatically in response to the sun’s UV and high-energy visible (HEV) light rays, and then quickly return to clear (or nearly clear) when indoors. Photochromic lenses are available in virtually all lens materials and designs. Tinted lenses. Sometimes a light or dark hint of color on the eyeglass lens can be beneficial to aid in vision. For example, a yellow tint may increase contrast and a gray tint may not alter color perception with sunglasses. A light tint can also hide the signs of aging around the eyes. Mirror coatings. If you are looking for a purely cosmetic lens that allows the eyes to be hidden from view, then this is the coating for you. Mirror coatings come in a variety of colors such as silver, gold, and blue. How Should You Care for Your Eyeglasses? Always store eyeglasses in a clean, dry place away from potential damage. Clean your eyeglasses with water and a non-lint cloth, as necessary, to keep them spot-free and prevent distorted vision. See your doctor annually to check your eyeglass prescription. While eyeglasses can correct some common vision problems, it is important to have routine eye exams to keep the eyes healthy. This buying guide will help you cut through the hype about different types of eyeglass lenses and help you choose lenses and coatings that offer the best features and value for your needs. When buying eyeglasses, the frame you choose is important to both your appearance and your comfort when wearing glasses. But the eyeglass lenses you choose influence four factors: appearance, comfort, vision and safety. A common mistake people often make when buying eyeglasses is not spending enough time considering their choices of eyeglass lens materials, designs and coatings. The following information applies to all prescription lenses for glasses — whether you need single vision lenses to correct nearsightedness, farsightedness, and/or astigmatism, or you need progressive lenses, bifocals or other multifocal lenses to also correct presbyopia. The index of refraction (or refractive index) of an eyeglass lens material is a number that is a relative measure of how efficiently the material refracts (bends) light, which depends on how fast light travels through the material. Specifically, the refractive index of a lens material is the ratio of the speed of light in a vacuum, divided by the speed of light in the lens material. For example, the index of refraction of CR-39 plastic is 1.498, which mean light travels roughly 50 percent slower through CR-39 plastic than it does through a vacuum. The higher the refractive index of a material, the slower light moves through it, which results in greater bending (refracting) of the light rays. So the higher the refractive index of a lens material, the less lens material is required to bend light to the same degree as a lens with a lower refractive index. In other words, for a given eyeglass lens power, a lens made of a material with a high refractive index will be thinner than a lens made of a material with a lower refractive index. The refractive index of current eyeglass lens materials ranges from 1.498 (CR-39 plastic) to 1.74 (a specific variety of high-index plastic). So for the same prescription power and lens design, a lens made of CR-39 plastic will be the thickest lens available, and a 1.74 high-index plastic lens will be the thinnest. The Abbe value (or Abbe number) of a lens material is an objective measure of how widely the lens disperses different wavelengths of light as light passes through it. Lens materials with a low Abbe value have high dispersion, which can cause noticeable chromatic aberration — an optical error visible as colored halos around objects, especially lights. When present, chromatic aberration is most noticeable when looking through the periphery of eyeglass lenses. It is least noticeable when looking directly through the central optical zone of the lenses. 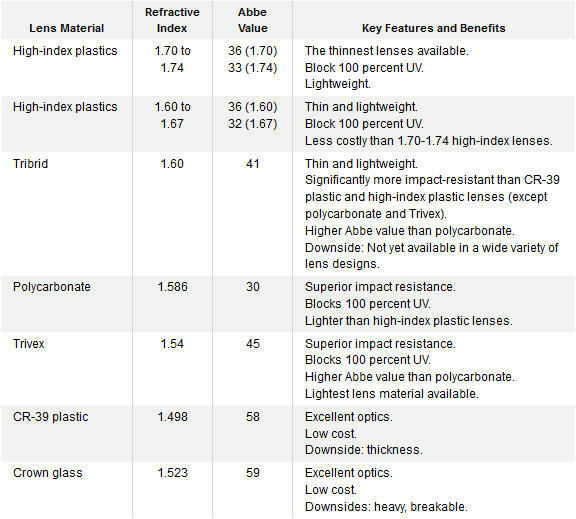 Abbe values of eyeglass lens materials range from a high of 59 (crown glass) to a low of 30 (polycarbonate). The lower the Abbe number, the more likely the lens material is to cause chromatic aberration. Abbe number is named after the German physicist Ernst Abbe (1840-1905), who defined this useful measure of optical quality. In addition to choosing a lens material that has a high index of refraction, another way to give your lenses a slimmer, more attractive profile is to choose an aspheric design. Aspheric designs — where the lens curvature changes gradually from the center of the lens to its edge — enable lens manufacturers to use flatter curves when fabricating eyeglass lenses, without degrading the optical performance of the lenses. Because aspheric lenses are flatter than conventional (spherical) lens designs, they cause less unwanted magnification of the wearer’s eyes, for a better appearance. In some cases, aspheric designs also improve the clarity of the wearer’s peripheral vision. Most high index plastic lenses are made with aspheric designs to optimize both the appearance and the optical performance of the lenses. With polycarbonate and CR-39 lenses, an aspheric design usually is an option that increases the cost of the lenses. The FDA has guidelines for impact resistance, so there’s a limit to how thin an optical laboratory can grind your lenses. In (concave) lenses for the correction of myopia, the thinnest portion of the lens is the optical center, located at or near the middle. In (convex) lenses that correct farsightedness, the thinnest portion of the lens is at its edges. Because of their superior impact resistance, polycarbonate and Trivex lenses that correct myopia can be fabricated to a center thickness of just 1.0 mm and still pass the FDA impact-resistance standard. Myopia-correcting lenses made of other materials usually have to be thicker in the center to pass the standard. The size and shape of your eyeglass frames also will affect the thickness of your lenses, especially if you have a strong prescription. Choosing a smaller, well-centered frame can significantly reduce the thickness and weight of your lenses, regardless of the lens material you choose. Generally, the thinnest lenses for your prescription will be aspheric lenses made of a high-index material, worn in a small frame. Depending on the type of lenses and lens treatments you choose and the lens design you need, your eyeglass lenses can easily cost more than the frames you choose — even if you choose the latest designer frames. So how much will your glasses cost? That’s hard to say. The amount you pay for your next pair of glasses will depend on many factors, including your visual needs, your fashion desires and whether you have vision insurance that covers a portion of the cost of your eyewear. Keep in mind that if you choose high-end designer frames and aspheric, high-index progressive lenses with premium anti-reflective coating, it’s not unusual for the cost of your eyeglasses. On the other hand, if you’re buying your child’s first pair of prescription eyeglasses with polycarbonate lenses for mild myopia, the cost will be much closer to $200 for quality eyewear, including a scratch-resistant warranty. To get the best value, it’s essential to understand the features and benefits of the products you are considering and to choose wisely with the help of a reputable eye care provider and/or eyewear retailer. Buying eyeglass lenses can seem daunting, but it doesn’t have to be. The key is getting accurate, unbiased eyeglass lens information from sources you can trust. For greatest satisfaction with your eyewear, in addition to using this guide, follow this advice echoed by Consumer Reports: During your eye exam, ask your eye doctor which eyeglass lenses and lens treatments are best for your specific needs and eyeglass prescription.